Disclaimer: This is my experience in the installation of the trigger kit. It worked well for me, but there is always a risk in modifying your own gun. Bring it to a gunsmith if you just want a nice trigger. If you enjoy understanding more about you gun, develop skills to diagnose and work on it, this is actually a good progress to go through yourself. Installing APEX FSS as a beginner? 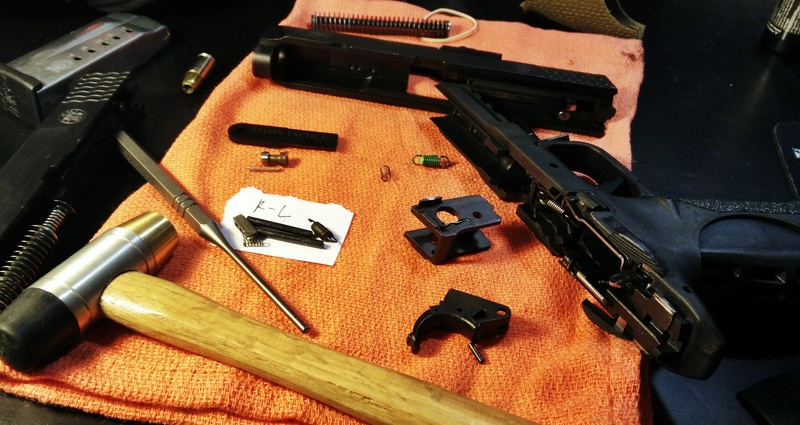 So if you are wondering if it is possible to install the Apex Forward Set Sear (FSS) Trigger Kit without any prior gunsmithing experience, I’m going to say yes. If you can be careful, understand instruction, decent with tools (e.g., using a punch, vice), then it should go relatively smooth. Prior to installing the trigger kit, I have zero experience in gunsmithing. The most I’ve done with my gun was simple cleaning and some stippling of the back strap. I have never even detail stripped my gun before thinking about installing the FSS trigger kit into my full size M&P9. 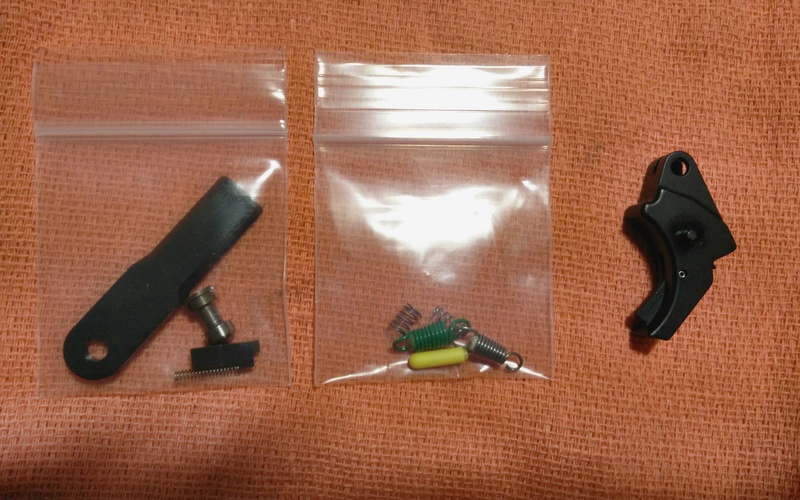 What is in the Apex FSS trigger kit. What I did to prepare? Before even going out to buy the kit and tools to do this, I watched every installation videos on youtube I can find on installing Apex trigger. The list of videos include not just the FSS trigger install, but the AEK trigger, duty/carry kit, and installing in the Shield. The more you watch, the more angles you can see how others do it. Also, some folks use the Apex armorer block, and some don’t. Watching others could give you a few ideas on how you want to approach this project (based on your comfort level). Tools that I used (or would get if i do this again). nice here. I got a nice set of Grace USA punches, given I know if one day I don’t need it, The Grace set is easy to sell). Two 3 lb dumbbell weight as my bench block. The holes is really what I need to get the roll pins out. My “bench block” – thick leather on top of dumbbell. pin through. I used two 3lb detachable dumbbell weight and put leather on top to protect the frame. Most people use some kind of armorer block (plastic/nylon) or wood block. Vice – to hold the slide while you take the rear sight out. The M&P sights are notoriously hard to take out. A place to organize all the loose pieces. I used a bright orange cloth to lay out all the parts. This is really useful since there are a lot of moving pieces. A bright orange cloth is where I organized all the loose parts. Sight pusher – would save a lot of time dealing with really tough sights. The issue was that I don’t have a proper solid workbench. I was doing this on a desk, so although the vice was attached to the desk, it was very tough to drive the rear sight out, since the desk would move and the force is lost that way. It took me a total of about 2 hours to do this whole installation. With ONE hour being trying to remove, and put back the rear sight. At the middle of it, I realize it was due to my desk not being a proper work bench, so it diffuses the force when it shakes. Use a sight pusher if you don’t have a proper workbench to not diffuse the punching force. The trigger pin holding the trigger to the trigger bar is tricky to install. It is pretty tough to hammer the pin in while holding the trigger bar in place to attach it to the trigger. Eventually, I used my vice to install the trigger pin. I placed the trigger with the pin between the vice. Tighten it enough to hold in place. Put trigger bar in correct position while tightening the vice a little bit. Repeat until trigger pin goes through trigger bar enough to keep it in place. Then punch the pin in. There are several very small springs. Be very careful when dealing with moving part. Always gently take it out while holding on to possible flying pieces. If you are handy, not afraid of marring up your gun a bit? Do it yourself. You’ll learn a lot about your gun this way. I see gunsmiths asking for $70 or more to install this kit. The only mistake I made was marring up my rear sight (which is an aftermarket 10-8 sights), so if I do eventually sell this gun, and the seller wants it pretty, I can just put the original sights back on. Next → Next post: First month of Brazilian Jiu Jitsu (BJJ) – How it is exactly what I needed.